He can easily be termed the Salman Khan of international football. With a temper that’s shorter than a bonsai and an attitude that could shame a five-year old, Mario Balotelli is the epitome of self destruction. Be it at Inter Milan, Manchester City or, now, AC Milan, striker Balotelli has succeeded in grabbing headlines for all the wrong reasons. This season, too, the striker walks the same, shameful road. The Italian’s tryst with trouble continued when he was handed a three-match ban after being sent off at the end of Milan's 2-1 home defeat by Napoli on Sunday. Balotelli, who missed a penalty and scored a late goal in the game, was given a second yellow card after the final whistle for arguing with match officials. In addition to the automatic one-match ban, he was handed an additional two-game suspension for "directing insulting and intimidating expressions to the referee at the time of the sending-off". As Balotelli keeps jumping from one controversy into another, Rediff.com brings you a quick recap of episodes involving the ‘undisciplined Italian’. Balotelli first shot to fame as a super forward at Inter Milan in 2007, playing under manager Roberto Mancini. He shared a good relationship with the manager and that resonated in his performance on the field. 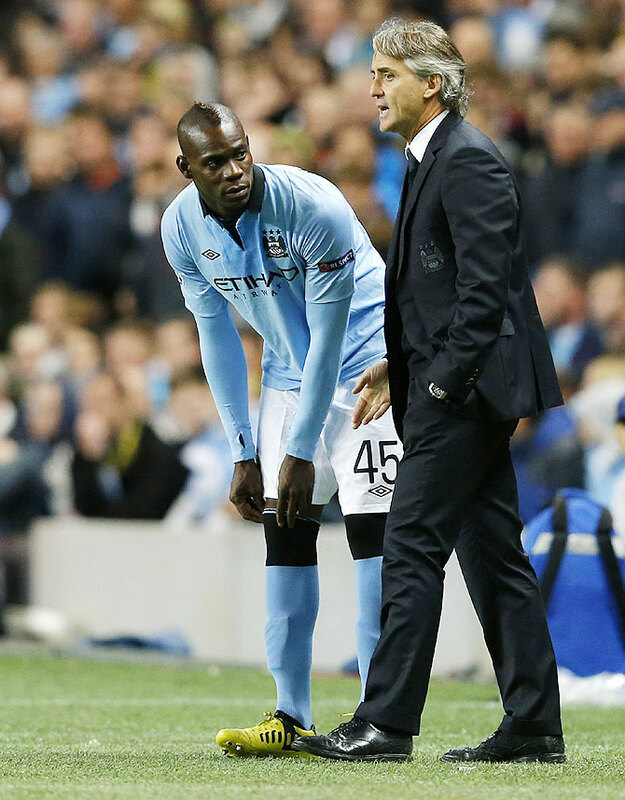 He also had very few disciplinary issues as 'father-figure' Mancini ensured that the Italian striker behaved well. 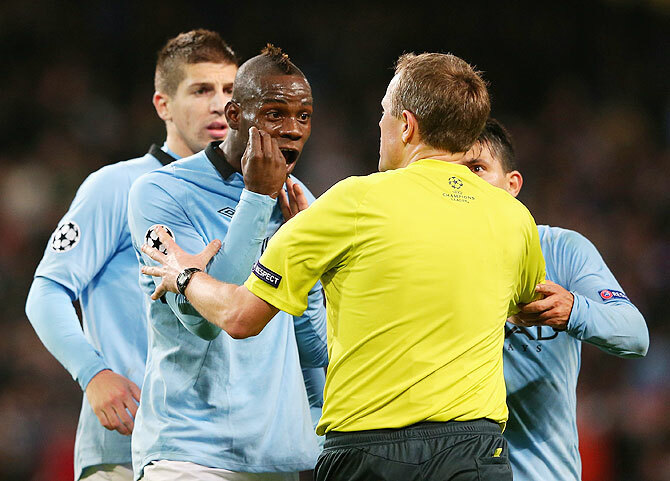 Then in June 2008, with the exit of Mancini, Balotelli’s disciplinary ways nosedived. He would have regular disagreements with new coach Jose Mourinho and was eventually suspended from Inter’s first team in January 2009. 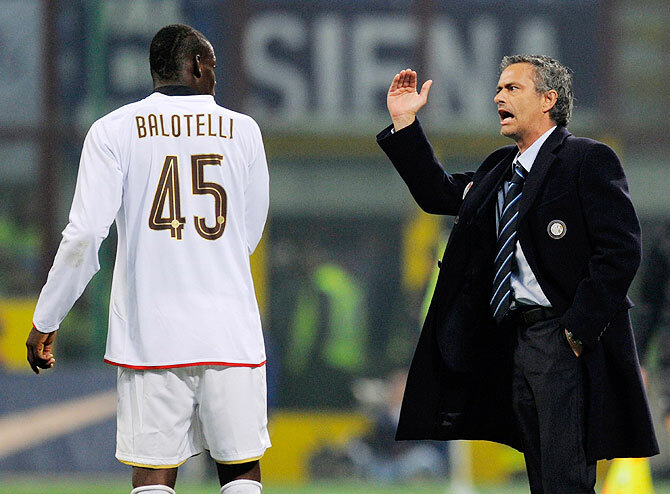 The duo's relationship and Balotelli's behaviour was so out of control that Mourinho went on to describe the Italian as 'unmanageable’. Mourinho accused Balotelli as coming up short during training. The player was also heavily into diving and became a target of racist chants by Juventus fans during Serie A matches that season. 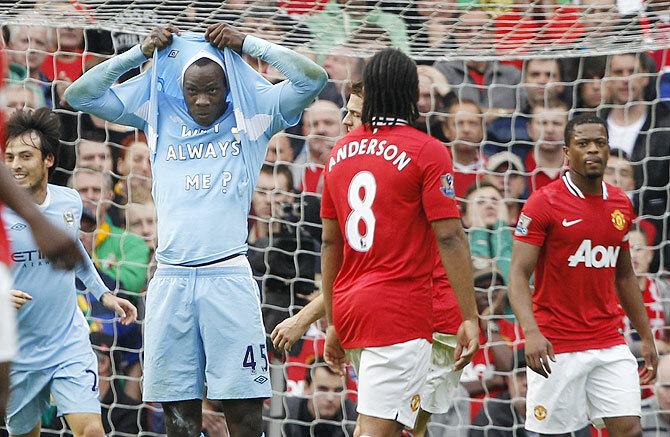 As the season progressed the Mourinho-Balotelli relationship soured. Balotelli continued his trashy ways and after the 2010 Champions League semi-final against Barcelona, he threw his jersey on the ground in retaliation to Inter fans booing him. This particular behaviour was slammed by all and sundry and even teammate Javier Zanetti made his disgust known. 'Mario needs to focus on doing what he can do on the pitch, he can't allow himself to behave like this,' said Zanetti. In 2010, Balotelli moved to Manchester City. Once again, with Mancini watching over his ‘delicate’ ward, things were looking up. Balotelli impressed in his first season in the English Premier League. He was consistent on the field, but received multiple warnings in his first season in the EPL. It never looked like his disciplinary problems would decrease anytime soon. In December 2010, he claimed he had never heard of Jack Wilshere after beating the Arsenal midfielder to FIFA's Young Player of the Year award. In March 2011, during a Europa League draw with Dynamo Kyiv, he was sent off. But his generous attitude came to light in April 2011 when he reportedly won £25,000 at a casino and gave £1,000 to a homeless man. However, his bad-boy reputation was being cast in stone with off-field disciplinary issues making headlines. 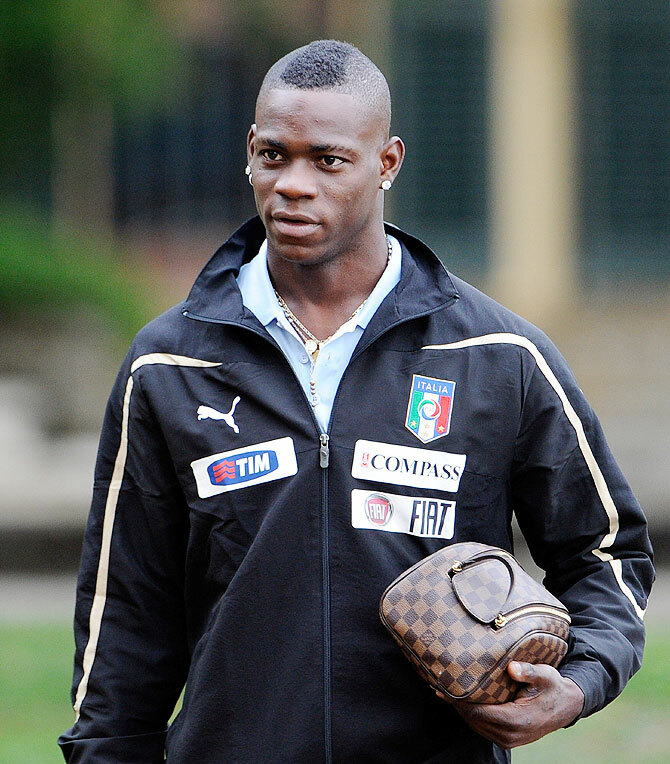 And once arrived at an Italy training with a ladies purse! He also claimed suffering a grass allergy in the middle of a match. 'I'm ready to take on responsibility, even if people think I'm not. They seem to talk more about my private life than about what I do on the pitch,' he added. Balotelli’s tryst with yellow cards and suspensions continued well into his second season. He broke a club 48-hour curfew by visiting a curry house ahead of a match against Chelsea. A few days post the incident he was again in the news after pictures surfaced of a training ground bust-up with team-mate Micah Richards. On January 22, 2012, he came on as substitute during a match against Tottenham Hotspur and stamped Tottenham's Scott Parker, but, already booked, did not get a second yellow from referee Howard Webb, who missed the incident. He was charged for violent conduct for the kick against Parker and suspended for four matches, three for violent conduct and one for his second sending off. Balotelli clashed with team-mate Aleksandar Kolarov over a free-kick in the home game with Sunderland on March 31 in which he scored twice in a 3-3 draw and British media reported that he was involved in a training ground bust up with Yaya Toure. Mancini went on to deny the claims, calling rumours of dressing room tension between Balotelli and other players 'totally false'. In April 2012, Balotelli received his fourth red card of the season, after a second yellow during the match for a tackle against Arsenal’s Bacary Sagna during City's 1–0 loss to Arsenal. He was banned for three games (one for the two yellow cards and two for the previous two red cards in the same season). Just a couple of days before the Arsenal tie, he escaped unhurt from a car accident in Manchester. It was his second car accident in two years. Within days of joining Manchester City, he was involved in a car crash and reportedly carrying £5,000 cash at the time. When a police officer asked why he had such a large sum of cash, Balotelli replied: ‘Because I am rich’! The Italian also got into trouble with referee Peter Rasmussen for denying him a penalty during the Champions League Group D match against Ajax last November. Fed up with the Italian’s undisciplined attitude, City docked Balotelli two weeks' wages late last year. The club handed down the fine after deciding that he was guilty of a series of breaches of discipline. After failing with an appeal to the club's hierarchy, he instructed his agent to pursue City through a Premier League tribunal. In January this year, pictures emerged of a training ground fracas involving Balotelli and Mancini. That was the last straw. 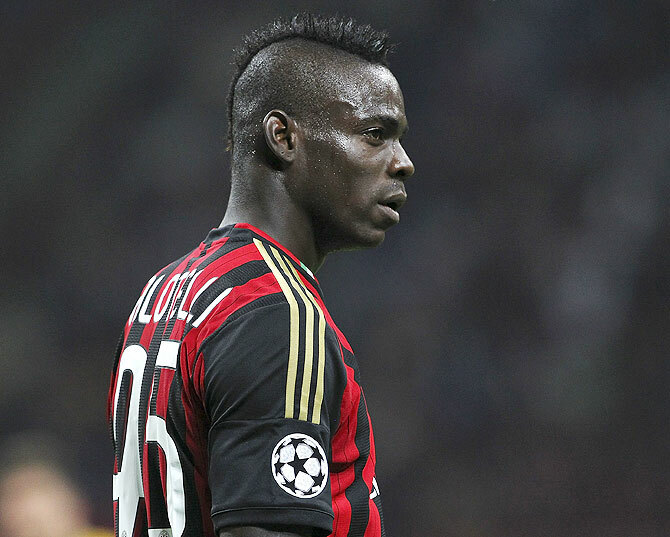 The January transfer window marked Balotelli’s return to Italy – this time it was AC Milan. Another year, another country, but Balotelli was refusing to grow up. In February, the AC Milan striker was fined by police following a row over his parked car at a city airport. Two months later, the maverick forward was caught smoking in the toilet on the train during the team’s journey to Florence. The following week he was given a three-match ban for insulting the fourth official at the end of AC Milan's 2-2 draw at Fiorentina. Until Sunday’s red card, he was successful at keeping his behaviour in check. Only time will tell if the Maverick Mario can keep away from further trouble and maintain a low profile.